As you probably already know, before it was a great Disney movie, Big Hero 6 was a Marvel Comics property. What you might not know is just how radically different the characters first looked like when they débuted in 1998 - and now the team's creators are revealing their original concept sketches for the first time. Big Hero 6 as a team made their début in Sunfire & Big Hero 6 #1 back in 1998 - they were originally meant to début in Alpha Flight #17 before scheduling issues saw them appear in their own standalone series first - and were created by Steven Seagle and Duncan Rouleau, who now are part of Man of Action Entertainment, the team that make Ben 10. To celebrate the film's release, Steven and Duncan have started sharing their very first concept sketches for the team on MoA's blog, giving us a glimpse of the team's first designs. Suffice to say, if all you're familiar with is the look of Disney's movie, you might be a bit surprised. Pretty different from the cutesy version that has everyone d'aawing in the movie, isn't it? (Also appropriately super 90's. Those are shoulder pads Blizzard would be envious of!). 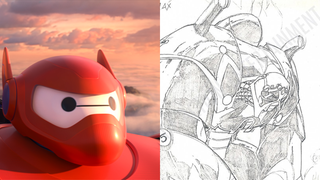 They're not far off what the original comic book creations would become, but still, it's interested to see the radical difference between the first incarnation of Big Hero 6, and the new movie. Seagle and Rouleau will be showcasing a new piece of concept art on the Man of Action Blog every day this week - so if you're interested in seeing more of what the original superhero team looked like, you'll be able to check them out at this link.